So how did your ticket buying experience go this year? For me, it was a combination of frustration and irony. The good news, we got our tickets. The bad news, I spent more than three hours online trying to complete the process – despite getting in the queue just a few minutes after the noon start time. At one point, I even received a message that there were no more tickets available. Fortunately, I didn’t give up based on that message, and, indeed, after less than 30 more minutes of waiting, the sales portal opened up and I was given the privilege of spending the better part of $1,000 to attend yet another Burn. Lashes (center), son Eric and his girlfriend Natalie soaking in the playa ambience. The lesson may be, let the system work out its kinks with the early adopters and just wait until the dust has cleared to go after your tickets. Or maybe not. A number of Burner friends have posted on Facebook that they were unable to get their tickets and would have to wait for one or another re-sale opportunity. And of course there’s the usual posting about some idiot trying to sell a Burning Man ticket for $10,000 on ebay. The greatest wisdom I can offer for those who failed to get a ticket or forgot to register is to wait patiently for tickets to become available through Burning Man’s own ticket re-sale program (STEP), or via Craigslist. I’m pretty down on ebay because people seem to use that venue to inflate ticket prices. 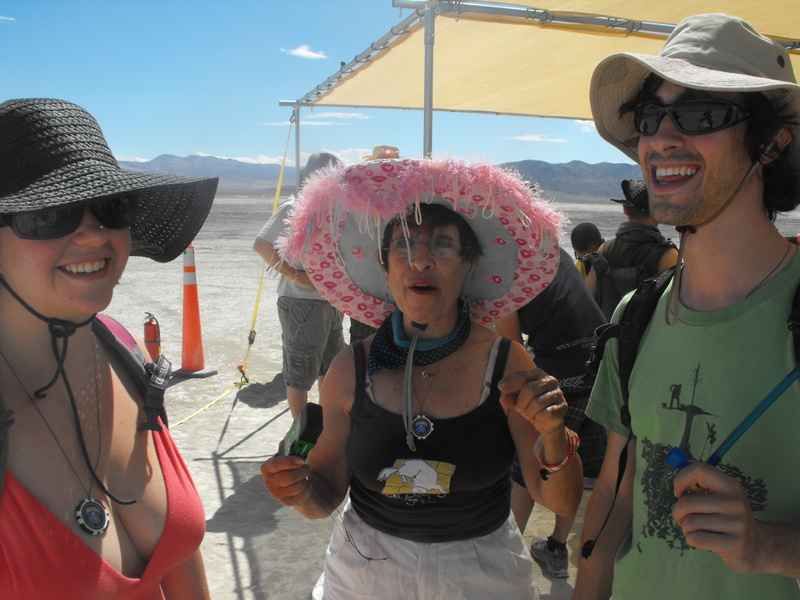 The risky part of purchasing tickets from non-Burning Man sources is the possibility of getting a counterfeit ticket. That’s why your best source of tickets is either Burning Man itself or a person you know and trust. I’d love to hear your anecdotes about this year’s ticket purchase process. This entry was posted in Uncategorized by sunr8563. Bookmark the permalink.